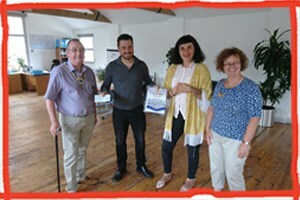 The wonderful bunch of Rotarian’s that make up the Sovereign Harbour Rotary Club have donated an incredible £500! We recently went to meet the Sovereign Harbour Rotary Club at a lovely little restaurant in Sovereign Harbour, Eastbourne. We introduced them to the charity and explained about what it is we are trying to achieve with opening a respite centre for disabled children, and what relief it could offer their families. They were taken by the efforts of our team, and came along to our centre to hear more and have a tour of the new premises. We welcomed them with open arms, we love showing our local communities what we are up to. We spent a lovely few hours telling them about the development of the centre, and the journey so far. They then surprised us and whipped out a cheque for £500! This amount of money is so wonderful for the charity, and goes a long way in providing care for the children we look after in the community and in the new centre when we open in just a few short months. We would like to thank the Sovereign Harbour Rotary club for their support, kindness and the truly wonderful donation, without them we would not be doing what we are doing, so thank you.